My husband and I are huge fans of sushi and we recently discovered the best gourmet sushi house just minutes from where we live. The only problem is that sushi can be quite an expensive habit. 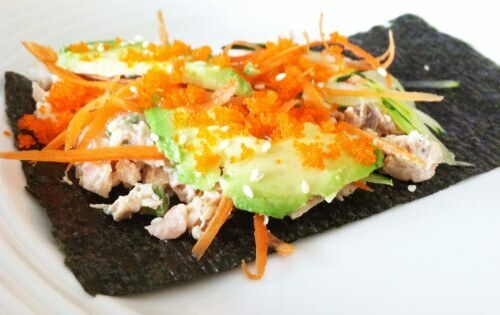 My wallet was starting to take a beating from all the sushi trips so I came up with this recipe that satisfies my sushi cravings and is something that doesn’t hurt the back pockets. And if you’re one of those people that says “ick” and turns your nose up to sushi, don’t count this out just yet! 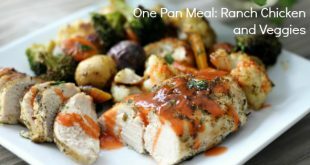 Everything is completely cooked in this recipe so there’s nothing to be scared of. 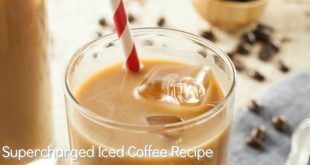 Give this recipe a try and I think you’ll fall in love with the amazing flavors of the pacific rim just like I have. 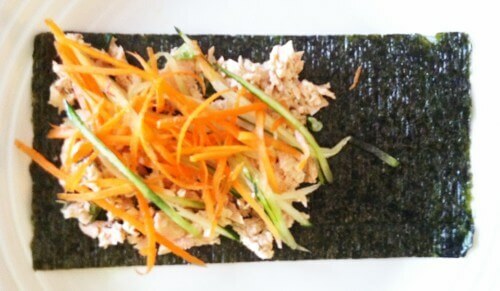 If you are new to the whole sushi idea and don’t think you are ready for the seaweed paper yet, try this recipe without the seaweed paper and eat the salmon salad over the thinly sliced carrots and cucumbers and then add whatever extras you want on top of the salmon – still nutritious and just as delicious! But, if you are are feeling brave, definitely try the seaweed paper. Not only is it yummy, but it’s super nutritious! It’s an amazing source of minerals like magnesium, potassium, and folic acid just to name a few. Plus it’s high in protein. FYI – many commercial seaweeds are sprayed with pesticides so I like to buy certified organic seaweed paper. 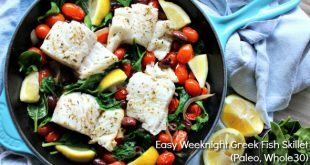 We all know that salmon is a wonderful source of nutrition, but did you know fish eggs are a nutrition powerhouse?! I hope I haven’t scared you off with the idea of eating fish eggs, but they really are one of the best things you can eat. Fish eggs are prized possessions in traditional cultures throughout the world for their ability to nourish and give optimum health for pregnant women and growing children. I buy the super tiny fish eggs, called flying fish roe or Tobiko. They are so tiny that I can’t even tell they are there. If you eat a whole spoonful at one time, they taste salty. But truthfully, you won’t be able to taste them if you spread a spoonful out on whatever you are eating. I try to incorporate them in my diet as often as I can because those tiny eggs are packed with one of the biggest nutritional punches. They are difficult to find and usually you will have to go to an Asian grocery store or perhaps a fish monger. I buy small containers from my sushi house. This salmon salad tastes even better the following day, so I always prepare the salmon salad the night before, which makes assembling the rest of the ingredients so easy. Also, these rolls make a really fun party food. I like to create a “sushi bar.” I chop, grate, slice all my topping ingredients and then put them in individual plates or bowls on my kitchen island. Each person goes down the line and assembles their own unique handroll with whatever toppings they choose. 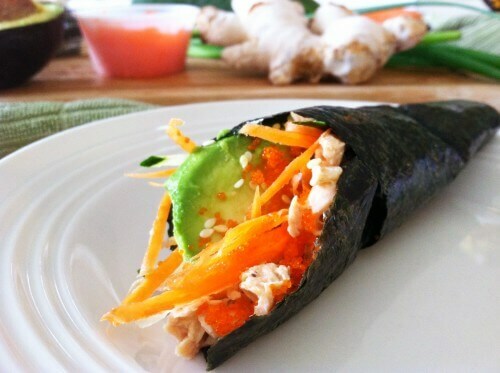 I hope you will give these highly nutritious rolls a try! *This Y-shaped julienne peeler is wonderful and what I use to make the very fine slices of carrots and cucumber. I also use this handy tool when making my “zucchini spaghetti.” It’s one of my fav gadgets! Also, I’ve found out the hard way that not all julienne peelers are created equal. I found a less expensive version before I discovered this one and using it was extremely frustrating. This Zyliss one is awesome! Grease your baking pan with about 1 tsp of oil. Season your salmon with salt and pepper. Grate fresh ginger all over the salmon. Place thin pats of butter equally on top of the salmon. 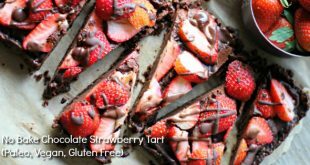 Bake for 6-10 minutes per inch of thickness. When the salmon is finished cooking, set it aside to cool for a few minutes. Once cooled, flake the salmon in a medium bowl. Add in green onions, mayo, sesame oil, soy sauce, fish sauce and the lime juice. Stir to combine. 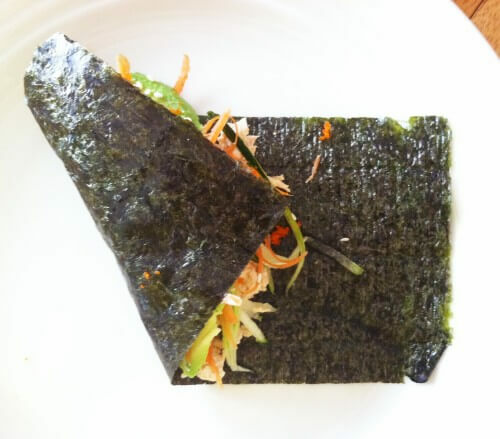 Lay your seaweed paper flat and place the salmon mixture over 2/3 of the seaweed paper. Add any toppings you wish over the salmon. 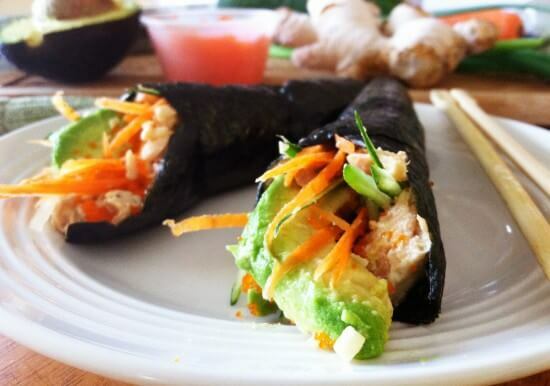 Roll the salmon up and eat right away. Enjoy! 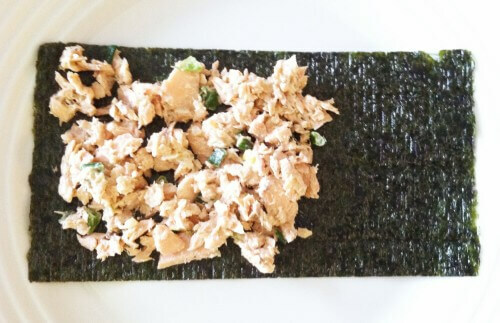 Place 2 to 3 spoonfuls of salmon salad over 2/3 of the seaweed paper. Place your julienned carrot and cucumber on top of the salmon salad. Grab the bottom left corner and place that corner at the midpoint at the end of the filling. 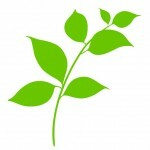 Great mention about purchasing organic seaweed! I LOVE salmon. Have you thought about trying a cashew cream sauce in place of the mayo? These are delicious! I’ve been making these for my lunches. I make a big thing of salmon salad and prep the veggies on Sunday. Then I just take the seaweed paper along separately and I have lunch for almost the whole week. I love them!!!! I think the fish roe you find in the asian grocery stores is dyed to be that bright pinky orange, isn’t it? I always liked it, but I’m a bit wary of food dyes. Do you know what the scoop is on that? Yes, it can be dyed sometimes. 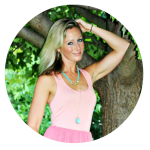 I am very wary of food dyes, too so it’s important to me to find the natural versions!